So apparently there was a meeting last night about the Art Department … to which the Art Department was not invited. But I heard through someone who was there that it was ugly. Apparently, Talal informed those present that none of us UK people know what we are doing (!) and we just waste money (Let me add that this is the same person who has paid me to be here eight weeks but allowed me to do nothing! And let’s not get on to Chris, the designer, being here since last November!!!). Anyway, curiously the one art department person that was there was Fozan Salaheen – a local, and ATG’s go-to designer. I have been told Fozan is not only the new designer on “Malik”, he is now the Construction Manager on “Medinah”! I foresee several problems here. First, ATG knows that they are not allowed to have “Medinah” crew work on other productions. But hey, we’ve been here before so there’s nothing new in their allegedly using “Medinah” funds to finance their other productions. But there’s another problem: I was told that during the meeting he flatly denied agreeing to do a test piece for us about 4 or 5 weeks ago, that he had stopped responding to my phone calls and emails, only to then eventually email me saying he would, well — let him explain in his own words…. Now after this I asked him about another test he was supposed to be supervising for us. Basically, we wanted to know if local artisans could reproduce stone walls convincingly. We gave Fozan a sample to show to someone. Fozan proceeded to argue about how it should be done (which seemed to defeat the point of doing a test). Anyway, we never saw the sample. 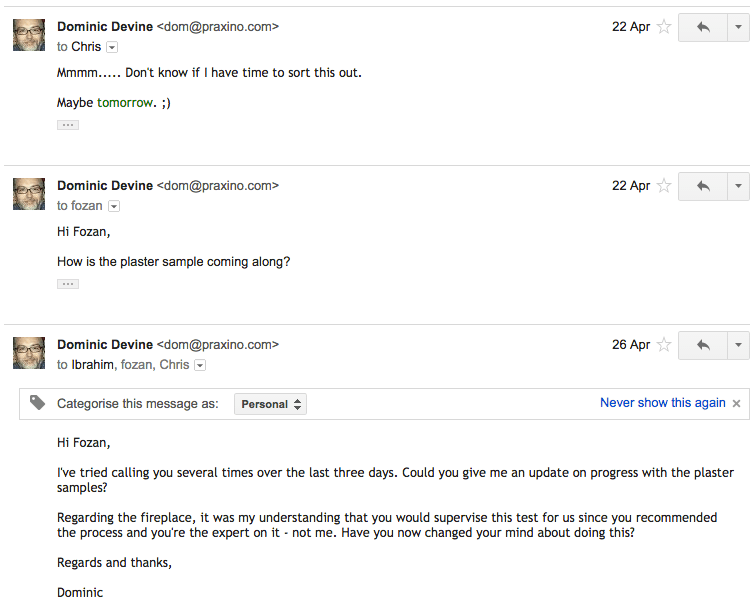 Instead, the following email exchange happened. Notice that although I call it an exchange, none of them are from him. Fozan had disappeared. So anyway, Fozan suddenly reappears at yesterday’s meeting. And today I see him hovering around the office, but Fozan does not talk to me. At one point I was in the kitchen. He came in behind me, saw me, and promptly left. I know because I saw him looking at me reflected in the window. So Chris and I then had a chat in which we agreed we would politely try to work with Fozan but that we should pick up where we had left off. So I looked for Fozan but he had vanished again (on past occasions he has walked into the office because he has been told to, he has checked I’m here, then left without saying “Hello” on the pretext that I looked busy!). So I texted Fozan and sent him an email. Here’s how it looked. He didn’t answer my text or email. So at 11:49am I called him. No answer. I called again. This time he answered — maybe because he knew I was not going to stop until he did. He told me he was in a meeting with Ibrahim. I said “okay” and we agreed he would call me later to arrange a meeting later this afternoon. Let’s see if that happens. But one last thing. Not long after I sent this message, Fozan returned and confronted Issam – who had no idea what was going on. Fozan slammed Issam’s brand new MacBook on the desk- damaging the body. I missed this as I was at the other end of the building being told that Fozan was arranging interviews with carpenters without discussing this with me first. I’m not sure this is true but the fact I believe it could have happened speaks more about the lack of diplomacy and professional etiquette at ATG than it does about Fozan. Meantime, here’s the email I sent him after the call. Here’s a little backstory on Fozan. When we first met I was impressed. He talked about his passion and drive to do something worthwhile. Problem is, since then all I have seen him do is talk. Finally, on an aside, ‘Bob’ just told me he called Ibrahim again to ask about his wages. Ibrahim promised they’d be paid tomorrow. He then said, “Bob, come on, you’re supposed to be on our side, not theirs”. Apparently, it went right over Ibrahim’s head that there was something very wrong with this statement and that there should be no sides (see what I mean about a cult?). It seems to me that ATG is so used to screwing people over, they are no longer capable of seeing themselves as part of a team. It’s usually the case the thing a person or ‘company’ hates most is the very thing they are most guilty of. Why would you trust anyone else when you know you cannot be trusted? So it’s “us and them”. Great. Since writing this entry, I have become very fond of Fozan. It took me a while to understand his position – that he is a respected designer in his country who was basically being told by Talal to be a runner for an Art Department from another country. No wonder he was acting up. ‘Bob’ is a pseudonym that I shall be applying to a group of people to protect their identity in instances where ATG might seek to punish them. This entry was posted in ATG - The Cult, Us & Them and tagged bob, cult, fozan, ibrahim, issam, malik, part of the team, talal al awamleh. Bookmark the permalink.